Last week I showed you how I organize my family favorite recipes. Today, I’m sharing how I organize my recipe inspiration. I’m talking about those recipes that one spots and says “mmmm… that sounds yummy, I think I’ll make that someday.” So how does one keep track of all those different recipes? Me, well when I find a recipe online, I PIN it to Pinterest, under the recipe category. Simple as that. When I’m looking for a different recipe to make, first I go to this binder that you're about to see, next I go looking on my pinterest. If I decide to try it that week, I print the recipe. 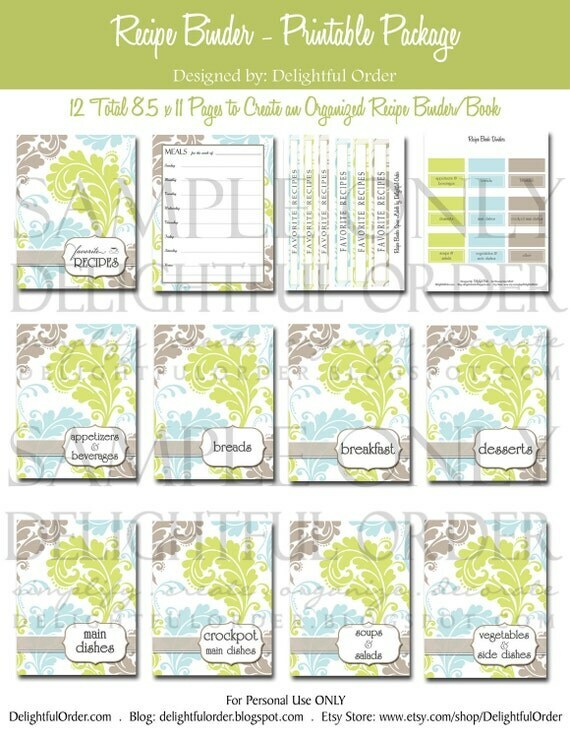 If I think it’s a keeper, it may possibly be transferred onto my recipe cards and added to our family favorite binder, which is the spot I go looking first while I plan our meals for the week. With all those recipes that I spot in a magazine or book, I tear them out, or make a copy of them, depending on the magazine or book. To keep them all organized I use another binder that looks just like the favorites binder. click the image above to be directed to this item in the shop. but with a different cover page. the tabs are the same. Those are part of the printable pack. Simply print, cut-out, fold and staple on. I created a different side label too. mine are from Office Depot. I simply inserted each divided page from the printable set that I created into the sheet protectors. I laminated the ones in my family favorites binder. and I actually stapled the tabs directly onto the sheet protectors. Inside each section, I put recipes that I’ve torn out magazines. or copies of recipes that I’d like to try someday into go into the sheet protectors. I keep a bunch of extra sheet protector pages in the back of the book, which makes for easy additions. And that’s it. I store our Family Favorites Binder and this Recipe Inspirations binder in my baking cabinet next to all of my recipe books. Do you have a different way of organizing all your recipes that you’d like to try someday? Or what about those family favorites? Do share, I’d love to hear from you. Very neat idea - thank goodness for Pinterest! I love how you use it as your first step to then narrow down to what you want to print. In addition to using full page sheet protectors (oh, how I love them! ), I also use plastic photo holder page protectors (where it's separated for photos of 3x5, 4x6, etc) which I've found to be very helpful for recipes on index cards from family and friends ... as well as recipes that don't take up an entire page in the magazine. I have a binder for recipes but it is not as neat and pretty as yours. Love the Pinterest idea! What a nice way to keep all your favorite recipe organized. Thanks for sharing. Where did you find tab dividers that stick out further than the office depot page protectors? I've yet to find any that do! All I've tried have been narrower and get lost in the pages. I cut them out and stapled them on the page protectors.